(Newser) – British officials say they've been unable to trace the rightful heirs to a trove of gold coins found stashed inside a piano and worth a "life-changing" amount of money. The school that owns the piano and the tuner who found the gold are now in line for a windfall after a coroner investigating the find declared it treasure. 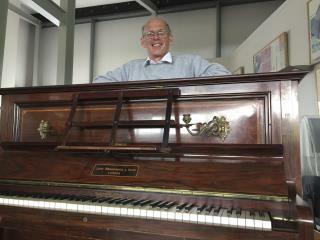 But a couple who owned the piano for three decades before donating it to their local school will likely miss out. Coroner John Ellery said Thursday that, despite a thorough investigation and a public appeal for information, "we simply do not know" who concealed the coins, discovered last year when the piano was sent for tuning in Shropshire, central England, reports the AP. Chances were the gold was hidden because Hitler had plans to invade England and didn't. It's mine dude, previous life. Please return it. I hid it in there cos the King and Queen wanted me to pay up for their lifestyle. Can he tune a fish?